Another beautiful day, weather wise. And like yesterday, I got out and enjoyed it. I first did my body awareness work. Amazing, that if I do this, I am not stiff and have a better ride. This is because I am more body aware. I rode Raudi to Grizzly Camp and then to the bench. I did not let her graze on the bench because I needed to get home – she was pissed, as if this was the ultimate form of betrayal. She was grabbing angerly at grass the entire way down the bench. Still, she was fairly focused. Otherwise, I would have come off. Company today, a blast from my past. Many years ago, when we got Tinni, a couple with three children came and visited – Trent and Jill, parents of Levi, Austin, and Celine. In February I ran into Jill at the Palmer Museum and suggested she apply for a job at the recycling center. She got the job and it is going well for her. 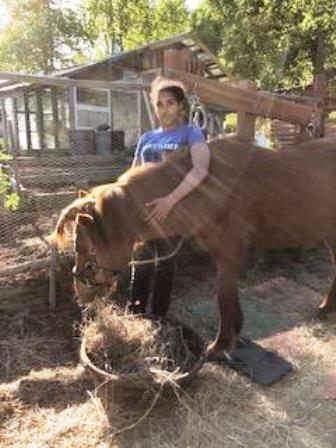 A few weeks ago she mentioned to me that her daughter, Celine, was having to write a report for school and had decided to write about getting on a horse. Jill asked me if Celine might come over to our place. I of course said yes. 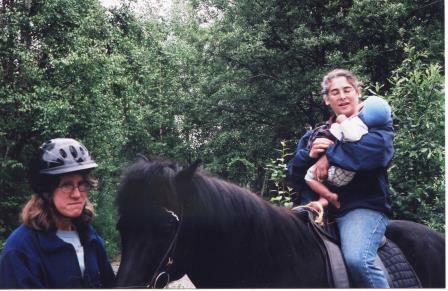 I had time to plan how I might honor Celine’s wish, to get on a horse, while at the same time integrating ideas about horse/human body awareness into the mix. Trent, Jill, Levi, and Celine arrived at 2:15 p.m. and were here until 7:30 p.m. I think it went well. We first gave them the garden/horse/alternative energy tour, then sat at the picnic table and ate chocolate chip cookies and drank their homemade lemonade. Then Celine, Jill, and I got down to business. We first headed down to the Playground of Higher Learning and played with the obstacles – for instance, we walked on the pole, a balance beam, and we walked around the space in our bare feet. We also played with balls and went over the entire June agility course. After, we headed to the horse corral, where we hung out. My intent was to have Celine pick a horse to work with, this rather than have me assign her one. Much to my dismay, she picked Tyra. The others are quieter and not as lippy. But I thought, well, this would be a great learning opportunity for both horse and handler. We spent time grooming her, then I put her saddle pad, bridle, and body wraps in place. This, I think, further relaxed her. Tyra WAS lippy – but Celine assisted me in working on this problem. After we did mat work, and crunches, and a bit of panther walk, I first had Tyra go around the outside of the buckets and on the other side of the scary corner. Then I had Celine do the same with her. It was remarkable, seeing Tyra actually become focused. I felt okay about the next activity. I got on Tyra and rode her, and then I had Celine get on her and used the supplement lid target stick. Tyra behaved just fine, and Celine made a new friend. So the lesson was a success. This is the sort of horse work I was meant to do. My hope is that like doors will open of their own accord.